Wear appropriate personal protective equipment. Cover all skin, at a minimum wear long sleeves, safety glasses or goggles and gloves. Make sure you are working in a well-ventilated area and that you read ALL instructions carefully before use. 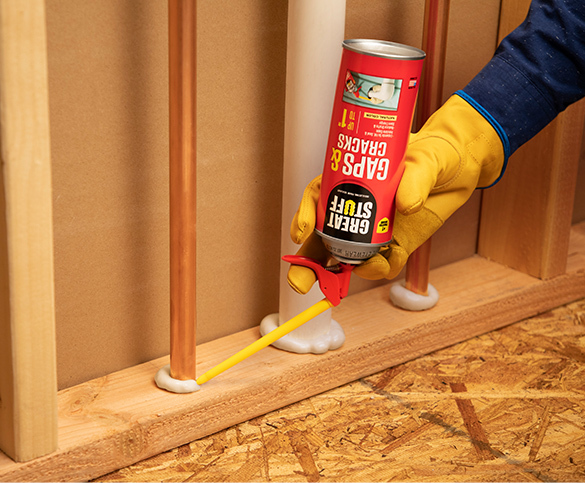 GREAT STUFF™ is not to be used for filling closed cavities or voids such as behind walls and under tub surrounds; this improper use of the product could result in the accumulation of flammable vapors and/or uncured material. Failure to follow the warnings and instructions provided with the product, and/or all applicable rules and regulations, can result in injury or death. Shake the can vigorously for a minimum of 60 seconds. Screw the threaded end of the straw assembly securely onto the valve. Practice using the foam on newspaper. Insert tip into gap and dispense slowly. Do not force it from the can. Cured foam can be trimmed, shaped, sanded, painted or stained. To trim, use a sharp knife or serrated blade. Now it’s time to clean up and dispose of empty can(s) properly. Empty cans can be recycled and non-empty cans should be handled according to your local regulations. 1*70 ± 5°F and 50 ± 5 % RH, 1 inch bead diameter, 6 inch length. Cure rate is dependent on temperature, humidity, and size of foam bead. See where you can buy GREAT STUFF™ and GREAT STUFF PRO™ in your neighborhood..